Life is a path with a beginning and an end. Around each bend in that path you’ll encounter mystery and choice. May be far different from the journey you finish. Lovely photo and thoughts. It’s difficult to plan. like they say: life is what happens while you’re making plans. Where would the fun be if we knew exactly how it was all going to turn out. Most of what is going on in my life, the photography and writing in particular, were not even faint blips on the radar of where I thought my life was headed. Photography is definitely something that keeps me going and that gives me a lot of pleasure. Work wise I’m stuck in a boring side track, so I need to use my creativity on other levels to avoid blowing my head off. Where does it lead? When was it last used? All things to ponder as one looks toward the bend in the line. I admire the lighting and composition of this picture, it is really beautiful. 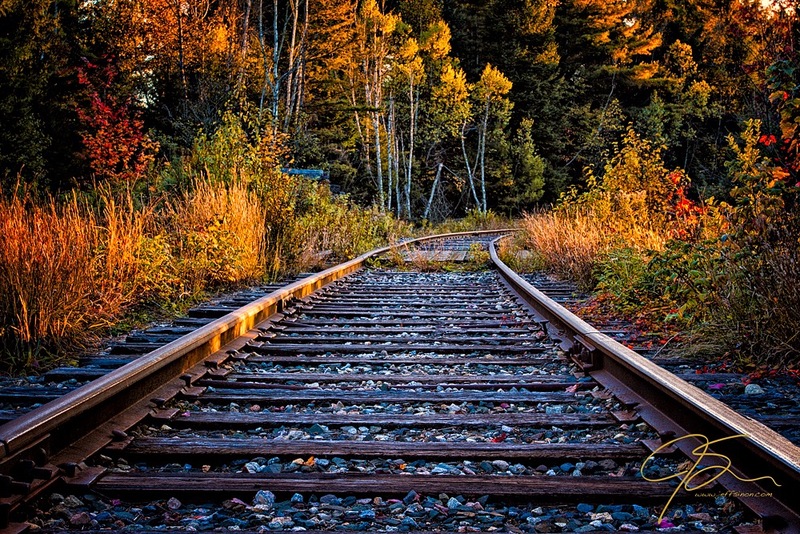 It leads the eye and the mind straight down the tracks into the unknown. Thank you. I’m always pleased and appreciative to hear more thoughtful comments on my photos. Exactly! We all begin and end the same exact way. How we live the journey, and embrace the surprises is what makes life worth living. Your photography is simply exquisite! I look forward to every shot and usually GASP! Thanks for sharing! Jodi that is such a wonderful compliment. Thank you! Really draws me in to this scene. Great shot, the colours are beautiful, and it really gets the imagination going as to what’s hiding around the corner. I wonder how many different things have been imagined after looking at your photo! Thank you. Great and thought provoking insight. I’d never really thought about how it might affect other people. It does make you wonder what others are looking forward to around their next bend. A path to the unknown. Lovely editing! It ends the same for all of us, but what happens along the way? I wonder. Great colors and composition – where DOES it lead to? Jeff, not only is the photo just fabulous, your words speak the truth! We can’t always tell where the journey will end.